I love pattern darning, almost as much as I love bargello. There's just something about it that makes a design so pretty. I finished up the pattern darning row on "Happy Haunting" late last night. I just have a few more rows and then I'll be on to the graveyard at the bottom! Can't wait for that! It's such a cute little graveyard. :) Write soon! You are really making great progress on this!! I don't mind doing the pattern darning, but always get messed up on the rows worked right to left. Wow, does that look good! I don't even know what pattern darning is, but I ASSUME it's what makes up the bit at the bottom--red diamonds. I do have a question about the rolla frame you're using there: which sizes are they? I've been contemplating ordering some from DSL, BUT, I just can't decide on what size I should start with. Great progress Nicole! Love the colors and bands in this one. Nicole, this is just so wonderful! It's so nice to get to see what the design looks like up close. Those SB pics are lousy (sorry SB!). I dont know what pattern darning is but it look beautiful. Lovely progress. Wow Nicole this is just so pretty and the picture on the pattern doesn't do it justice as yourstitching here does! I bet that the pattern darning was really fun. I think I am going to end up getting this one. I would put it up all year though. Too much work not to and it is so bright and cheery! I love it!! Gorgeous Nicole - can't wait to see the finished piece! Beautiful stitching! Darn it! I love pattern darning, too, but it's been ages since I did any. It was probably another SB project. wow it has great colours love it!! can't wait to see the graveyard too! You make quick work of every sampler you touch. The colors in this SB design are scrumptious! 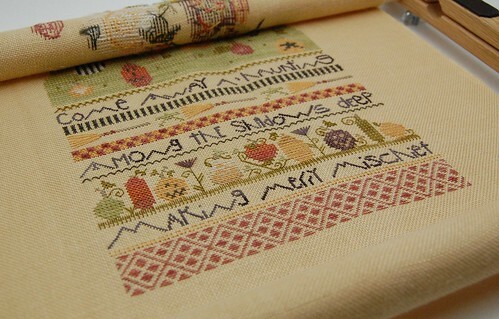 You would love Shepherd Bush's Millennium Sampler, that is almost all pattern darning. There is a photo in my album, under framed pieces. It's looking good. I didn't know graveyards could be 'cute' LOL! You've got a bit done since the last post, Nicole. Still looking lovely and such beautiful stitching. I think I've only done that pattern darning once before (Autumn Blessings?) and loved how the finished result looked. Keep those progress pics coming! I hesitated so long to ask you this...then I saw that I wasn't alone! What is pattern darning? There, I've asked. Is my face red? So very cute Nicole! Keep going! Gosh, Nicole, that's really pretty. Your pattern darning looks great too. You'll be done with this one soon. I so love their Halloween pieces. This design is so cute - great progress! This pattern just looks better each time you post it! Great progress, you're speeding along with it. Awesome Nicole! I really love this project. Darn, another one to add to the stash. This is really coming along, you stitch so fast! Thank you for the link to more info on the darning. Love your Halloween stitching, don't you just love working with those yummy fall colors? They are my favorite!! Such a beautiful piece - that pattern darning is so cool looking. Love it! Cute and graveyard shouldn't be in the same sentence but it sure applies here. Great job! Can't wait to see more. Only Shepherd's Bush could make a person say "cute" and "graveyard" in the same sentence! It looks fantastic! Looks great! I just tried pattern darning for the first time, and really enjoyed it. I see you're listening to Echo in the Bone--I just finished it, and loved it! Looks wonderful. I've only just started pattern darning after years of cross stitch and embroidery. You've given me a boost to really get going.